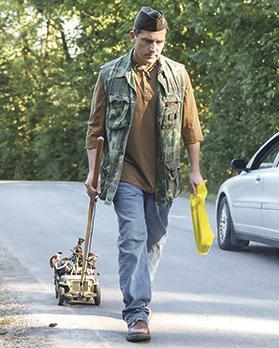 Steve Carell in Welcome to Marwen. Welcome to Marwen opens with a scene depicting Captain Hogie, a World War II fighter pilot, flying his plane over occupied Belgian territory. His plane comes under attack and he is forced to crash land. It is a scene typical of a war movie until, as, Hogie leaps out of the burning plane with his feet on fire (which he calmly puts out by jumping into a puddle of mud), you notice he is in fact… a doll. Interest wildly piqued, you watch as Hogie stealthily makes his way along the Belgian countryside, picking up a pair of ladies’ shoes to replace what’s left of his boots. Then he is set upon and beaten by a quintet of Nazi soldiers, only to be rescued by a troupe of femmes fatales… or rather, fantastiques. This colourful, action-packed opening introduces us to Mark Hogancamp (Steve Carell), a former comic book illustrator who after a horrific attack suffers from amnesia. 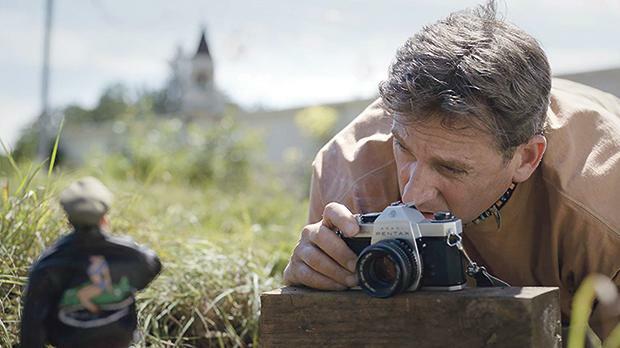 On medication, with few friends left, and an inability to mix with anyone, Mark retreats into a private world meticulously creating an art installation in which he has built an imaginary Belgian town called Marwen, where Hogie has set up residence, with only a few strong, reliable women as friends and allies as they constantly come under attack by the enemy. Using a bevy of impressively realistic dolls, buildings and surroundings, Mark immerses himself wholly in his imaginative world to escape his awful reality, creating scenario upon heroic scenario. Ironically, though, two events in his real life unwillingly compel him to change the narrative in Marwen to one that will lead to an ending he cannot control. One is the arrival of new neighbour Nicol (Leslie Mann) with whom he starts a tentative friendship; the second is an upcoming court date relating to the attack. Welcome to Marwen is an unusual little film, and works as a result of Carell’s sympathetic and understated performance and the astonishing realism the filmmakers have injected into the dolls’ scenes. Carell is a career comedian who has also graced audiences with some superb dramatic roles, and this is an eccentric and effective addition to his repertoire. From his confident narration of Captain Hogie’s adventures to his retreating into his shell when facing fellow human beings, lugging a toy truck full of dolls around as his security ‘blanket’, he offers an unabashedly heart-warming performance as this man in unimaginable emotional pain who taps into his unfettered creativity to self-heal. The female ensemble that makes up Mark’s support network may seem less well-developed. Mann does what she can with an underwritten role as the lovely but occasionally vapid Nicol. The rest of the group consists of Roberta (Merritt Wever), who works at the toy store where Mark gets his dolls; Carlala (Eiza Gonzalez), Mark’s colleague at the roadhouse where he works; Anna (Gwendolen Christie), the social worker who visits him monthly; Julie, who Mark befriended in hospital (Janelle Monae); and Suzette (Leslie Zemeckis), Mark’s favourite adult-movie actress. That said, possibly purposely, the women truly come to life in Mark’s fantasy world. Obviously, the cast voice their doll equivalents, and it is in these scenes that the film is at its best. The storytelling is equally compelling and comic, the action vibrant and violent, the characters fully-rounded – strong, supportive beings who have a wonderful way with words and weapons, as they battle Deja Thoris (Diane Kruger), the enigmatic, alluring and enchanting woman in Marwen who may prove to be Mark’s final fall into the abyss. That this unorthodox tale is based on a true story is astonishing, and I admit I was left with the niggling feeling that I wanted to know more about Mark’s life before the assault. But, I felt it was a conscious decision of the filmmakers to omit that part of his life, opting to celebrate his painful and simultaneously wonderful self-rehabilitation.